Now is the time for that second home, before the prices climb even higher. Recent figures from the National Association of Realtors show an upward trend in the number of second homes purchased for investment purposes. Investing in a second home now will be a great way to increase your net worth when you retire, if done properly. This book explains how to invest profitably in a vacation or future retirement home. Your second home can be for living, to re-sell, or even rent. This comprehensive guide presents proven tactics to make your second home a smooth and profitable transaction. You will learn precisely what to look for in a real estate investment, buying prospects, how to rent the place for up to 14 days and pocket the income tax-free, and how to make your current home groundwork for potential real estate investments, how to find the best opportunities, negotiating, financing, budgets, needs and wants, credit reports, home-buying timeline, the process of building a house, manufactured homes, real estate and mortgage glossaries, setting values, home warranties, homeowners insurance, creative financing, buying with little or no money down, closing, moving plans, walk-throughs, closing and settlement inspections, legal contracts, mortgages, what you can afford, deciding which neighborhood to choose, hiring a realtor, which government agencies can help, considerations for veterans, IRA use, hiring an attorney, the offer, calculating monthly payments, and escrow. 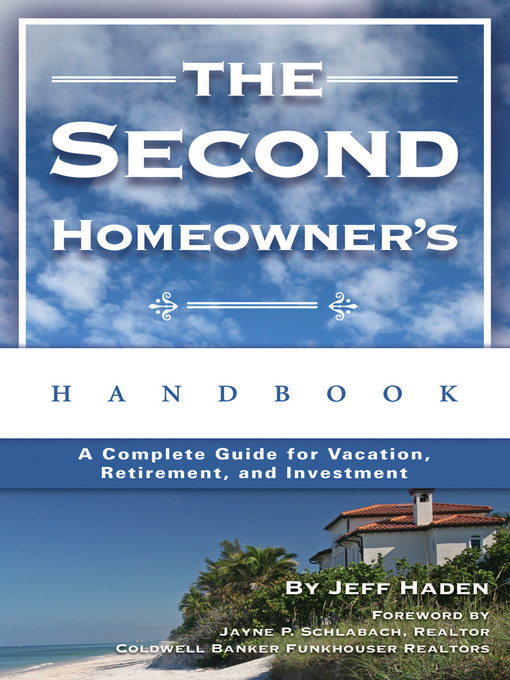 This book is a must-have for the investor considering a second home.